OurEnergyPolicy.org | The ITC Ruling: Could the Cure Kill the Patient? On September 22nd, the U.S. International Trade Commission ruled that low-cost, imported solar panels from China and other countries have hurt two “domestic” manufacturers: Chinese-owned Suniva and German-owned SolarWorld. Both companies are now insolvent. The ITC seems likely to recommend a steep increase in solar import tariffs. 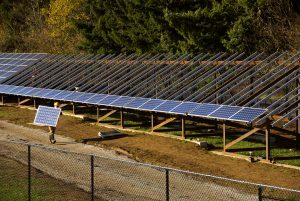 If the Suniva recommended tariff is implemented, the price of solar panels could double. Implementing such a “cure” for dumping international products into the U.S. marketplace could be devastating to our solar industry. It would hurt the expanding solar installation business, it would hurt U.S. racking, wire and balance of system manufacturing, and it would challenge U.S. leadership in solar R&D. The future of jobs in U.S. solar is not in panel manufacturing. It’s in solar installations and R&D for next generation technologies. SEIA estimates that 88,000 jobs would be lost if the Suniva-recommended tariff were imposed. Such a policy would favor a smaller amount of “solar manufacturing” jobs over a much larger number of “solar installation” jobs. Regardless of the President’s final decision, the uncertainty is already stunting progress in the solar industry and could have longer term consequences. Public Service Commissions are in the process of planning for the coming decade, and a higher tariff would impact their decisions. I’m particularly struck by the following possibility: Even with increased tariffs, production costs in China and other parts of Southeast Asia are so low that U.S. companies may still find it hard to compete. In that case U.S. solar installers and U.S.-based solar manufacturers will all lose. Even with a higher tariff on imports it’s not clear that solar manufacturing in the US is viable with today’s technologies. At the price point Suniva and SolarWorld could offer in the past, there wasn’t nearly the same demand that we have seen since prices dropped with the glut of cheap Chinese panels. Would a higher tariff allow companies like Suniva and SolarWorld to be profitable again? Not necessarily. Protective trade policy can produce unexpected consequences. One possible up side to the tariff is that foreign-owned companies might choose to manufacture in the U.S. to avoid paying higher solar tariffs. But if the tariff lasts for only 4 years, the incentive may not be long enough to attract new U.S. plants. 1. Would a higher import tariff cause U.S. solar manufacturers to become profitable again? 2. How will states meet RPS goals if cheap solar is taken off the table: will they invest more in wind and energy efficiency? 3. Should the President impose a significantly higher tariff if the ITC recommends one, or should he take different action? 6 Responses to The ITC Ruling: Could the Cure Kill the Patient? The issue raised by the USITC process is — should the USA put tariffs on components ? Virtually every US-made vehicle has imported components. Solar electric (photovoltaic) cells and solar modules (panels) are only a part of a solar system including mounting hardware, sometimes trackers, wiring. inverters, transformers, mostly made in the USA, and in some cases charge controllers and battery banks. The issue is would a component tariff save US manufacturers ? Likely not. Would a tariff severely harm US-made component manufacturers of the other solar system components? Absolutely, as the market contracts, businesses significantly ramp down and workers are jettisoned. And add another 88,000+ solar installation jobs lost nationally in addition. There are other ways to address component subsidies such as Federal, State, local government procurement requirements, guarantee requirements for component supply chain, State tax credits, and federal US manufacturer tax credits, all which will be far more effective in nurturing US component manufacturers. Six conservative groups (R Street, the American Legislative Exchange Council, ALEC Action, Citizens for Responsible Energy Solutions Forum, the National Taxpayers Union and the Taxpayers Protection Alliance) urged members of the US International Trade Commission to reject the relief requested by Suniva under rarely used but powerful statute, Section 201 petition on 9/12/17. They said the tariffs and minimum price floors requested by the two solar companies would double the cost of solar products in the United States, lead to retaliation by our trading partners and face a challenge at the World Trade Organization (WTO). They also stated while they oppose government policies that pick winners and losers in the energy marketplace, they were are equally hostile to protectionist trade measures that distort markets and invite retaliation by our trading partners. State Renewable Portfolio Standards (RPS’s) will surely be able to meet goals, not only through high-value energy efficiency, but the entire portfolio of other renewable energy options: geothermal, wind, waste heat & CHP, biogas (manures, sewage food processing wastes) & landfill gas, biomass (dead trees, untreated demolition wood, etc), concentrated solar power in our deserts, freeflow hydropower and hydropower on some of the 88,000 existing dams, and marine energy (tidal, wave, ocean thermal & currents). But photovoltaics at higher costs will still have solid, cost-effective market niches as well. There is a host of studies that I utilize in my GWU classes showing that the US can meet most or all of energy from these sources, economically. The United States has very many tools in growing domestic clean energy component suppliers, but tariffs are a blunt club, and there are finer, more effective instruments to get to the same goal without causing trade wars, and without losing tens of thousand of US components and installer jobs if the tariff is imposed. Marilyn, you correctly identified what is at stake by pointing out that the future of jobs in U.S. solar is not in panel manufacturing but in solar installation and R&D for next generation technologies. The point was also echoed by Scott in his response. Economics has sorted countries to their respective positions in the solar value chain where countries like China and Vietnam have a cost advantage in manufacturing while U.S. leads in solar R&D in not only solar cells, but also innovative racking, BOS, and O&M technologies. For these technologies to success and scale up, a large domestic solar deployment market is essential. If the ITC and the President decide to impose tariffs, it would inevitably hurt the market, and stifle technology innovation. My observation of protective trade policy is that it is a game of whack-a-mole. Countries like China and Vietnam adapt to tariffs by developing strategies to circumvent them. The anti-dumping and countervailing tariffs imposed on Chinese solar manufacturers led them to build factories first in Taiwan, and then to other developing countries in southeast Asia and south America. The tariffs did not stop Chinese panels from coming to the U.S. Although they did slow the pace of Chinese panel export to the U.S. by a little bit, they also incentivized Chinese solar manufacturers to build their oversea factories and in turn developed their global footprint. Tariffs is a short term solution and with foreseeable and unforeseeable consequences. One thing that is clear is that once the tariff is put in place, the cost of installing solar panels at either the distributed scale or utility scale will go up. Although there are many other sources of renewable energy, as Scott pointed out, solar is among the most mature ones, both in terms of the technology itself and financing mechanisms. There is such a strong momentum behind it up until this point that it would be a shame for the U.S. to deliberately take a break on developing solar energy. Originally passed in 1992, the credit lapsed in 1999, and resulted in a near halt in production. Congress continued to renew the tax credit in one or two-year stints, but allowed it to expire multiple times. This lead to boom-bust cycles of development and stunted industry growth. I worry policy uncertainty surrounding tariffs could have a similar effect on the domestic solar industry. Scott mentioned that he is confident states will continue to meet their RPS goals with a wide variety of technologies which may still include solar. I agree. However, I do think that this tariff will potentially hurt the growth of distributed generation. Solar was one of the only renewable technologies available to individual homeowners or small businesses both due to lower capital costs and widespread potential. Finally, its worth mentioning that even with a substantial tariff on modules (at the level requested by Suniva), the cost of panels remains a relatively small portion of installed system price. Module prices would return to ~2014 levels with 2/3 of the costs still coming from other components including: inverter, racking, BOS, supply chain, sales tax, installation labor, permitting fees, customer acquisition costs, overhead, and profit. Driving down these soft costs could enable the solar market to continue flourishing in spite of a bad trade policy.